OAuth2 is an authorization protocol that allows users to exchange data with third-party applications, without sharing their password and by limiting access. 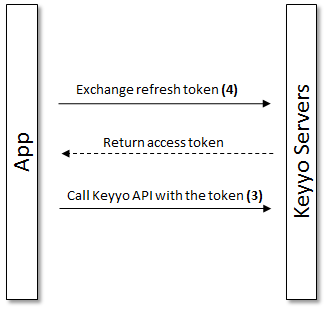 The following instructions provide detailed steps to help you use Keyyo APIs. For more details about OAuth2, refer to the OAuth 2.0 framework RFC 6750. Because an access token expires, when it happens, you need to ask for a new one with the refresh token you got in step 2. First, you need to register your app before starting. You will be redirected to your callback URL defined in your application settings. At this time, you will receive an authorization code and the previous state passed as a parameter in the URL. Exchange these values to get the refresh token and your first access token. Warning : If states don't match, it's probably a CSRF attack and the process must be aborted. 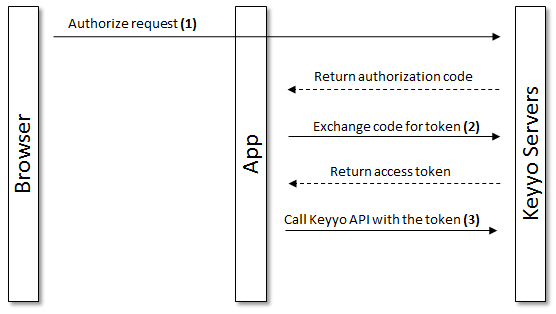 $client_id = "<Your client identifier>"
$client_secret = "<Your client secret>"
To use REST Keyyo APIs, we advise you to use Keyyo Manager library available on Github. For more information, you can refer to its documentation. When your access token has expired, you should use your refresh token to get a new one. Scopes limit the access to some parts of the APIs. If you try to access a specific resource without defining the scope in step 1, you will get a "403 Forbidden" error. You can define one scope or several scopes (separated by commas). Please refer to the Manager API Documentation for the list of scopes defined for its webservices. To get an authorization code you MUST provide 4 parameters as explained in step 1. "error_description": "Invalid request, parameters are missing"
To get an authorization code, the response type parameter is required and MUST be set to "code". "error_description": "The response_type parameter value is missing or incorrect, the value MUST be set to "code""
If state parameter is not supplied, the request cannot be processed. This parameter is used against CSRF attacks. "error_description": "The state parameter is required"
If your client identifier is incorrect, refer to your application settings to obtain the correct one. "error_description": "The client id supplied is invalid"